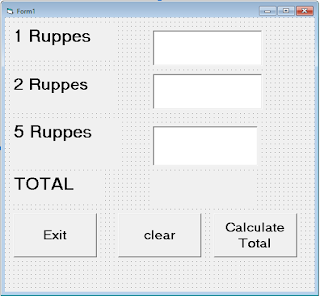 Hello everyone today we will create a Piggy Bank in Visual Basic 6.0. A very simple program, Things we will need in our form are 3 TextBoxs, 5 Labels, 3 Command Buttons and nothing else. 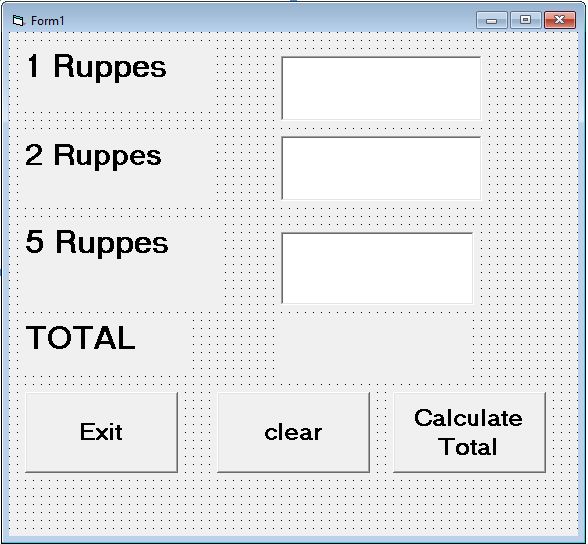 then we have a clear button, as the name describe it will clear the text boxes for new values if the user wants to add and lastly we have a calculate button that will add all the value containing inside the text box which the user has given. as we want our label where we are displaying our result. we want it to get clear before we add another entry so we did clear the resultLable too. 2.The writing End inside a code window will result in ending the program to be care full. 3. Val function is always used to convert a String to Numeric form When we enter a value in the text box at the run time the inputted text will be of a string DataType to use that data for calculation we have to convert it into numeric form. Ther is another function called CInt( ) function this will also do the same mentioned above. wait for the ad for 5 sec and then skip the add and enjoy.